A Tretakoff view of the world. Apple's iOS has routinely been beat up for the user interface in the stock apps that come with the iPhone/iPad. Lately, the criticism has been on the use of "skeumorphic" design (i.e. design elements meant to resemble a real-world analog, like the use of simulated wood and green felt on Game Center or the simulated brass casing on the compass), but lost in the noise is the real challenge: making the apps much more useful. Today, let's look at the iOS Calendar app and some of the alternative versions that may make you rethink using it. First, the standard app. Like most calendar apps, derives it's look from the classic paper DayTimer from the analog age. Decent information delivery, with the option to switch between List, Day, Week and Month views. Good separation and use of the screen real estate to display all day events vs. timed ones. A separate drawer to manage received calendar invitations. Prominent controls to go to Today, vs. whatever day you are on. Excellent accommodation for multiple calendars (i.e. Facebook events, multiple Gmail accounts, etc.). Easy, linear entry for new events, complete with the ability to invite attendees. 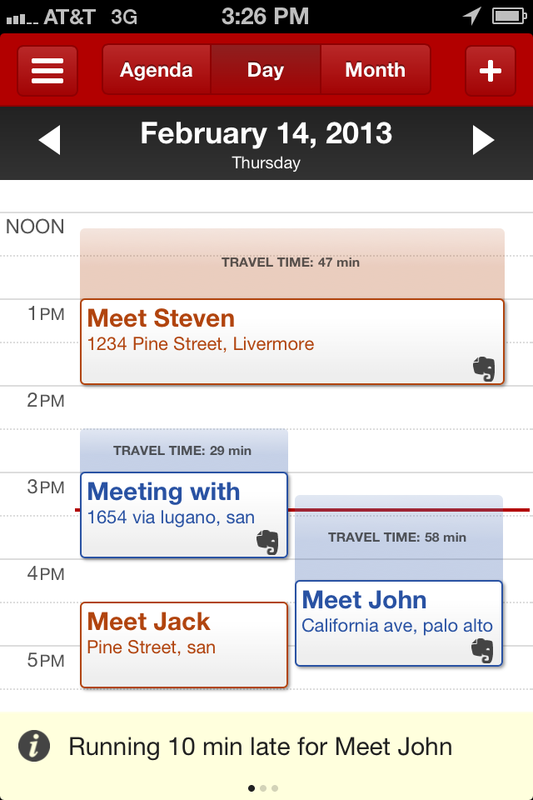 And, of course, Siri integration for hands-free calendar entry. 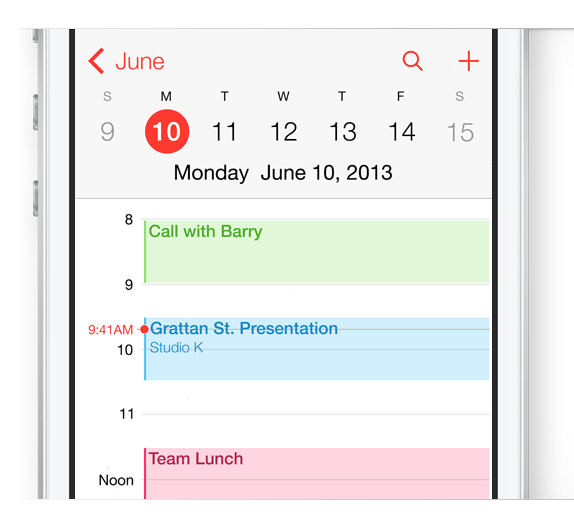 Apple iOS7 Calendar. Like most of the iOS 7 UI, it takes on the "flattened" look, maximizing the screen real estate, and slimming down fonts. A clean, modern look, with some additional UI nods, deliberately lifted from some of the best competitors. For instance, the split screen showing you a calendar and day view pictured here is a direct knockoff of Sunrise, which we'll get to later. Functionality? Not much change in the features, however, from what little has leaked out from the beta (the full version comes this fall). Just a facelift, but, to be fair, a darn pretty one. Sunrise. A new look for the calendar, making it much more usable, with more information on each event, such as attendees, type, and more. Intelligently presented, laid out as a endless scrolling day view, with easy navigation to go to specific days. But where Sunrise really (ahem) shines is its integration with multiple calendar services, and it's intelligent parsing thereof. For instance, you can see Facebook, LinkedIn and Google calendars fully integrated in the same view. It also adds in current weather, sunrise and sunset information, and pulls contact photos to show who's attending your meetings from your social media accounts. Directions are integrated with your choice of Apple's beleaguered Maps app, or the Google Maps app, if you have it installed: appointments with address entries let you get directions right from the calendar. Some minor drawbacks exist, however. The app takes a little too long to load at launch. 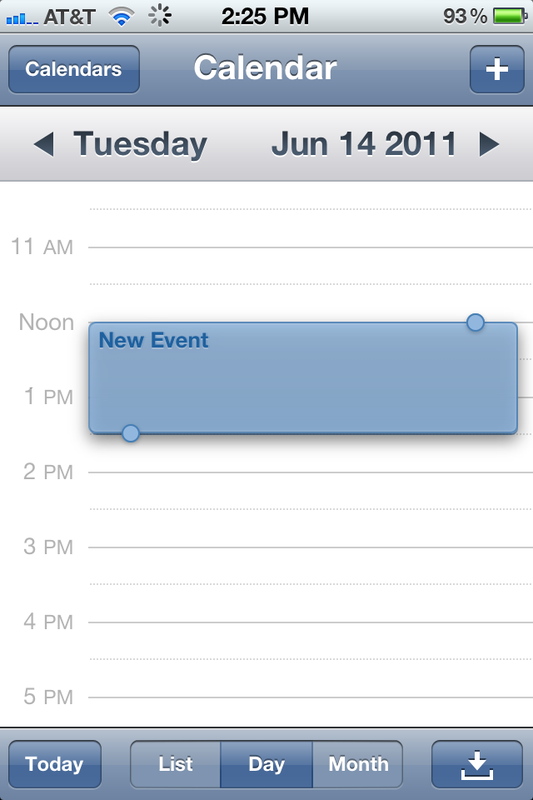 It also then needs to do an update of all of your calendar events, which can be embarrassingly long. No week or month view; just a hybrid of a day and agenda view. MobileDay. Have a lot of conference calls on your calendar? Then this is the app for you. It intelligently reads your calendar info, finds conference call and access code information, then allows you to connect to the call with a single touch, automating the tedious step of dialing, waiting for prompts, and entering in codes. This is exceptional for those of us in the car a lot: one touch initiates all you need, without need of pulling over to enter in those long sequences. It works with most every conference call service, knowing just how long to delay between dialing and entering access codes. And it pulls in the non-conference call events, as well. Easy prompts to quickly send an email to those attending a meeting if you are running late. It also uses color coded earmarks to distinguish what calendar the meeting is from. On the drawback side, some may indeed be put off by the slate-and-green color scheme. The only view is an agenda scroll, with sometimes too much information on the screen to get a good sense of your day. Another side effect of the display is that it does not visually represent overlapping meetings, so it's not helpful to detect conflicts. It is extremely call-centric, so meetings with calls are artificially larger than ones without. NeverLate. From a UI standpoint, it does not differ too far from the stock iOS Calendar, but NeverLate's expertise is under the hood. If your appointment has a physical address, it calculates when you need to leave by to make the meeting, based on current traffic conditions. It updates in the background, and alerts you 15 minutes before you need to leave with a reminder, as well as updating you on changed traffic conditions. It provides direct links to your favorite GPS app, prefilled with your from and to directions, including Apple Maps, Google Maps, and the newest Google $1 billion acquisition, Waze. It connects with Evernote to allow you to log notes from the meeting. It gives you (albeit with a couple of clicks) details on the meeting attendees, complete with thumbnail photos pulled from your contacts or LinkedIn, and allows you to text or email attendees. It allows you to call in for conference calls with a click, and uses good use of color and flags to indicate what calendar the event is from. You can also see your calendar in a map view, to see how geographically your day looks. On the downsides, navigating to Today while viewing another day does not have a dedicated control: you need to click on the date to get back. It also does not provide a week view. It's core strength of traffic forecasting is a little limited: it only pulls the traffic info at the time you are looking at the entry, rather than historic traffic info. Why does this matter? If you are trying to determine what time you need to get up for an early morning meeting, you only see the traffic info at the time you are looking at it. For traveling in the Bay Area, that can be a difference of up to an hour: if you are looking at it at 10PM, it will show you travel time as if you left at 10PM, rather than the 8AM time of the meeting. Many meetings come with information on the specific conference room in the address field, which it cannot parse, of course; if you update it with the address, and the meeting's conference room is changed, updates wipe out your additional address info. It would be better to allow you to tag a calendar event with a location, or choose from frequently used locations. Oh, and Facebook integration is non-existent, but if you have set up Facebook as one of your stock calendars, that's probably OK. So who's the winner? Actually, none. The closest winner for mobile professionals would be NeverLate, with it's intelligence and layering on of excellent, useful information. But the real winner would be to see a hybrid of iOS 7 Calendar's UI, with NeverLate's incredible intelligent assistance, MobileDay's one-touch conference call handling, and a touch of Sunrise's informational overlays and social integration. Now that iOS 7 is in beta, perhaps they will add such features before it's public release, but if not, let's hope one or more of these folks continue the innovation they have been bringing to the iFamily.